Malachi Heisler was still rattled Tuesday morning. He covered his face with a bandana as he told newsnet5.com's sister station WPTV about waking up to the sound of his name being called out around midnight. “I heard the words Malachi and help,” he said. Hearing the distress, he grabbed his rifle. Then he came face to face with a man, dressed head to toe in tactical gear, holding a gun to his mother’s head. “I had about 5 to 6 seconds to make a decision,” he said. In that time, Heisler says the intruder pointed the gun toward him. 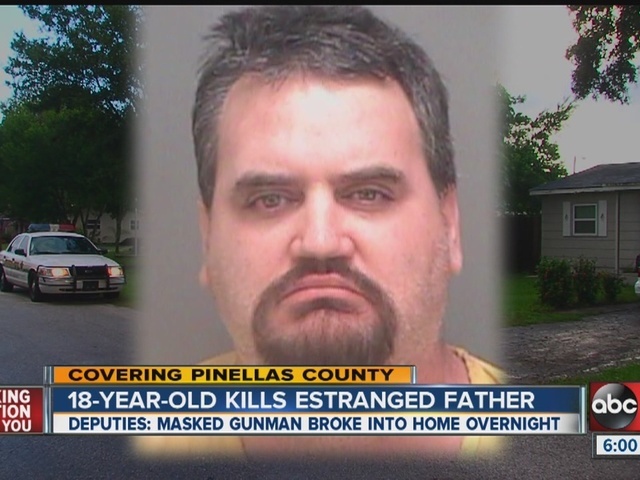 But the 18-year-old shot first, hitting the masked man in the head and killing him. That man turned out to be Heisler’s own father, John. “By the time I did recognize him, the decision was made,” he said. Malachi’s mother, Jolene Andrews, got a restraining order against his father in April, when Heisler tried to break into their home. He was arrested then as a felon in possession of guns. But the family said they hadn’t heard from him, until he came back at midnight, smashing in windows, and forcing his way into the home. Investigators said Heisler has a history of drug and alcohol abuse, and was likely drunk when he showed up. “It looked like he was there meaning business and playing for keeps. And to do some serious damage,” said Pinellas County sheriff Bob Gualtieri. As it turned out, however, the two weapons he brought were BB guns. But the sheriff’s office said no charges will be filed against the teen. “When you open the door and you see somebody dressed in all black, in fatigues, with a ski mask on and a gun in your mother’s face. He did the right thing,” said Guiltier. “Yes he had an injunction, he wasn’t allowed to be here. He came here anyway. Yes, he’s a felon, he’s not allowed to have guns. But he had a gun anyway. So there you go,” said Heisler. No one else was injured inside the home, including Malachi’s 13-year-old sister.